A new Kickstarter project getting underway today brings your Instagram photos to the way-back world of home picture projection, in a small, adorable package that suits perfectly the faux-vintage feel of Instagram photography. 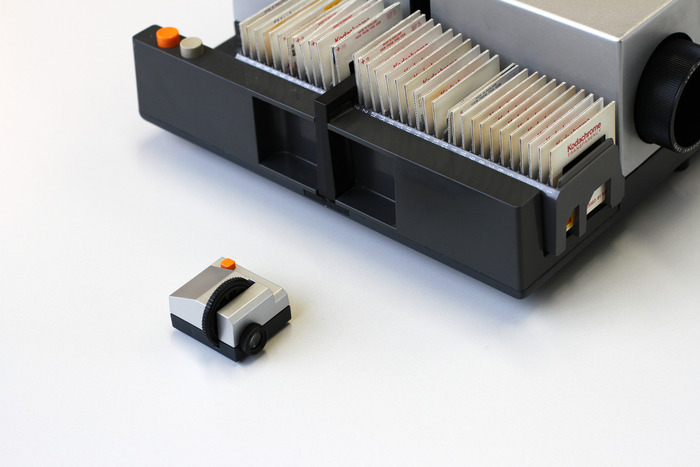 Projecteo is a very small slide film projector, which works with Instagram photos, by placing them on a single frame of 35mm Kodak film, with nine pics assembled on each. The pictures are then cut out and placed on specialized wheels for projection. The whole process sounds a little crazy, and also means that if you want more photos you’ll have to hit up Projecteo for future wheel development, but the projector itself is impressive, considering its size. The processing part of the equation is also simplified thanks to a web-client for ordering prints that makes shot selection a breeze. Projecteo uses powerful LEDs, as well as replaceable batteries and can output images at up to two and half feet wide in a very dark room. The projector itself is about the size of a matchbook, and uses just one, huge red button to page through pictures. A focusing element on the front lets you adjust image focus. Because this thing is so incredibly small, it’s likely not going to be able to deal well with competing with ambient light, and I’m also a little concerned it could have a hard time staying in one place when you’re pushing the button to check out the next image, since it can’t weigh very much. Update: Upon closer inspection, it looks like you spin the wheel to change photos, with the button acting as an on/off switch. 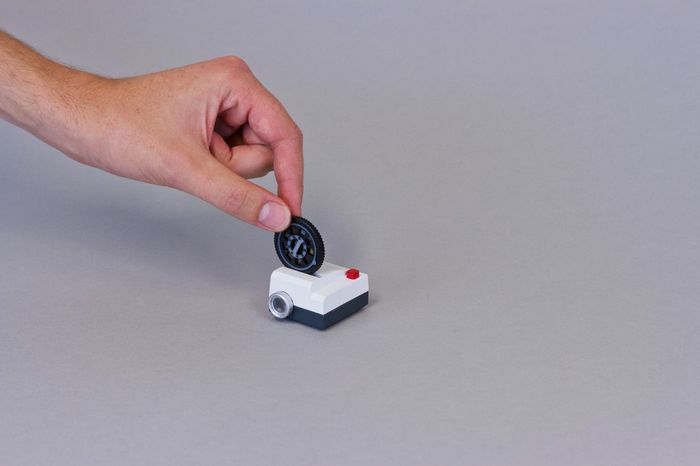 Still, this thing is cheap at just $20 for an early-bird pledge pre-order, or $25 after those are sold out, both of which include one photo wheel. The Projecteo team, which is also the same one behind Foldable.me and Stickygram, is clearly looking to build a device that works on the “cheap razor, expensive razor blades” consumption model, with a low onboarding threshold for the projector itself and a recurring revenue stream generated by ongoing film development. The Projecteo expects to hit production by December or January, which, based on my experience with Kickstarter, is perhaps overly optimistic. Still, the company has a very attractive special reward level with a Rollei P35-based design, and it also has one of the most honest “Risks and Challenges” section I’ve seen for new hardware projects, so I think there’s a very good chance this will make it to market and work as advertised. That said, is this something anyone can see themselves using more than once or twice?